This is the day on which the Christian year has peaked in excitement and faith for over 2,000 years. It's the of the triumph of life over death, sacrifice over slavery, Jesus over Pilate. Here's a photo with the whole story simplified. A Christmas cactus in blossom at Easter. I captured the picture early this morning. The plant did bloom over three months ago when Christians were celebrating the birth of Jesus. Very normal for the cactus. 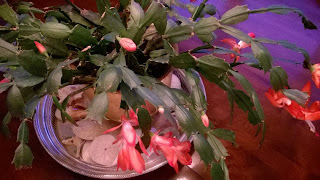 That's how it earned its common name: "Christmas" cactus (C.C.) . Every year it bursts forth about December 1. The blossoms die and fall in January. That's normal C.C. behavior. This year, Lucy and I noticed veritable bushels of buds springing forth in March. Unusual behavior! That's never happened before in the decade since we've owned and tended the plant. Suddenly, last week, buds began to burst into these beautiful flowers. This morning, April 1, it's headed toward full bloom. Maybe I don't have to rehearse how the plant copied our remembrance of the life of Jesus in 2017-2018. I took the photo early this morning and, without the use of any photographic technique on my part, the color purple dominated the background. Purple: for suffering. Just a wonderful, simple retracement of Jesus' life: miraculosu birth, blossoming into a life of teaching and healing, ending in woeful suffering, then miraculously blooming again in new life in three days. What a a cactus! What a symbolic, spiritual story. Next: off to the Cathedral for an Easter service. Now it's your turn. Anything like this happening in your house or yard? Your can reply below or on Facebook.